Happy Friday everyone! Last year I bought this tree right after Christmas for 50% off so I had to put it to use this year! I decided to put it in Isla’s room with pink ornaments to match!! She’s in LOVE with it and thinks it’s magical. I got the darling pink trees and ornaments from Gatehouse no.1!! And that insta story… how gorgeous are those Saint Laurent boots!! I love this! So cute! It’s so sweet that isla get’S her own decorations and mini-tree. When are you putting up Jackson’s nursery on your blog? I was thinking the very same. I’d love to see what you’ve done for a little boy’s nursery. Her room is just magical!! You have done such an amazing job! Gorgeous room! Will you share the wallpaper pattern/brand? Very pretty…looks so grown up! Wooow this room.is so pretty and chic and beautiful!!! I love this. It’s a little girls dream room! Wishing your family a very Merry Christmas. Did you use silk or polyester for the pink drapes? Beautiful! Aw, Isla’s room looks so pretty! I love the tree and decor you’ve added. 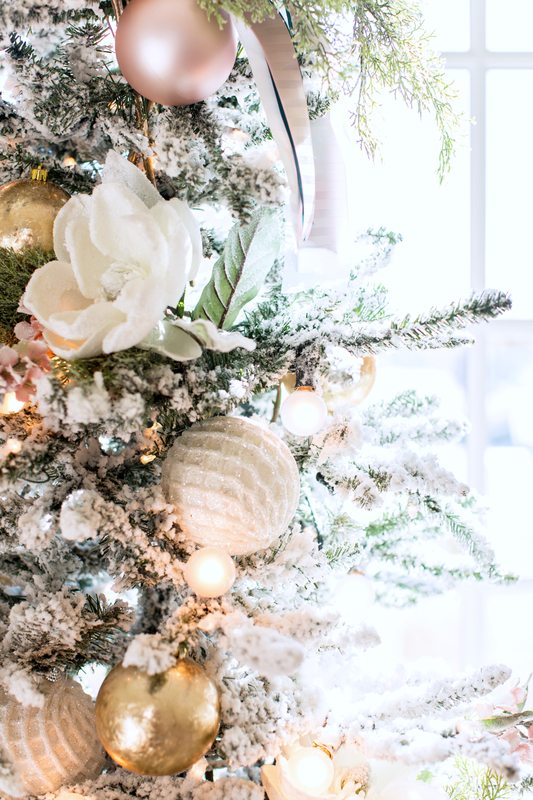 Your home looks like a winter wonderland for the holiday, absolutely gorgeous! Thanks for sharing, beauty, and have a great weekend! The cleanliness of Isla’s room is putting mine to shame right now lol. So beautiful! What a lucky little Christmas kitten! 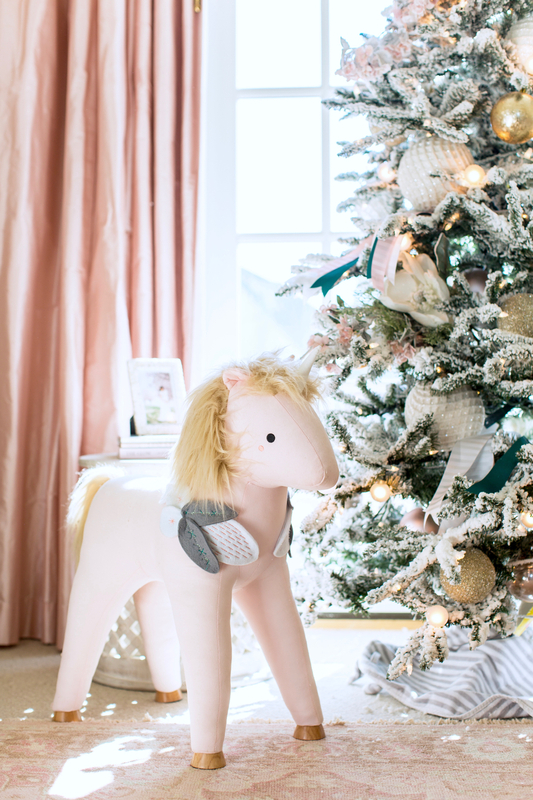 Her room is gorgeous and I just love all the shades of pink mixed with the white tree. CAN YOU SHARE NAME/BRAND OF WALLPAPER. LOVE IT! I usually never comment but just had to say how much I love this! So so cute! I love how her room feels like it’s still for a little girl but elegant/timeless as well. Love the decor!! That Christmas tree is so cute! Oh my gosh this is all so beautiful! How do you keep it looking so pristine with a toddler living in there? Also those curtains are amazing, I’m an adult and I want them in my room. I think I need a flocked tree next year. it’s so pretty! So dang cute I can’t stand it! Love her tree with all the gorgeous ornaments! That dresser is beyond gorgeous. Wish it was still available. Everything is so beautiful. This is breathtaking! Would you mind sharing where the birds dangling from the chandelier are from? They are too precious for words. Beautiful! So festive for miss Isla! Looks lovely! It look so beautiful and festive! A perfect pink Christmas! Thank you so much this is so sweet! Is this wallpaper? Where from? The room is beautiful! 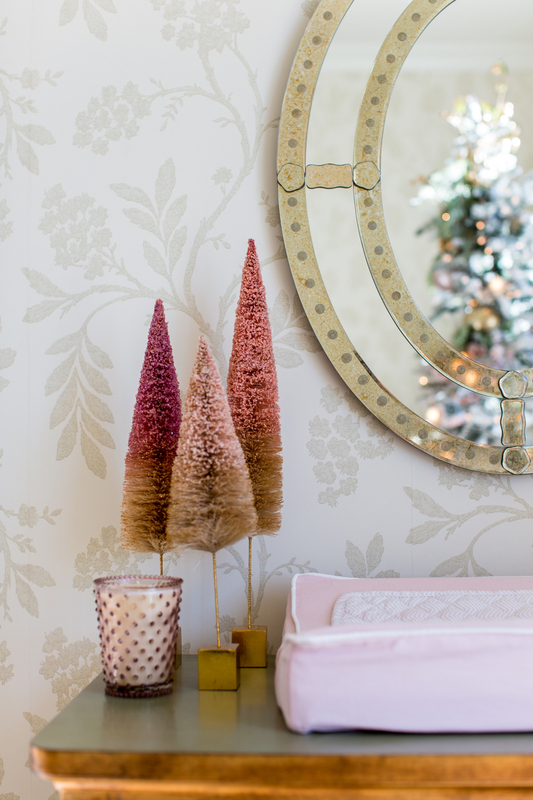 Ilsa’s room is so darling, I just adore the blush and gold accents, and with that tree it’s perfect! Beautiful room! Where did you get the pink unicorn? This is so precious! Like a little fairytale! This is so beautiful, that tree is one of the prettiest I’ve seen this year. Isla is one lucky girl! Such a cute post, Michaela!! Thanks for stopping by! Love the room. Where did you get the wallpaper from? I am in love with the wallpaper! Where can i find it or something similar? This nursery is so darling! Do you mind sharing Where the ottoman is from?